Among other distinctions, the Yamaha DTX-5100 has the most attractive speakers we've ever seen in a home-theater-in-a-box (HTIB) system. Their meticulously crafted gray wood veneers are finished in a stunning high-gloss clear coat. The well-appointed DTX-5100 also features a component-grade A/V receiver and a separate universal SACD/DVD-Audio/DVD-Video changer. Overall, its sound is extremely clear, though we found the subwoofer a weak link. The Yamaha DTX-5100 has a list price of $1,100, but you can find it online for hundreds less. The Yamaha DTX-5100 features a 7.1-channel A/V receiver, a five-disc DVD changer, and, oddly enough, a 5.1-channel speaker package (7-channel HTIB receivers usually come with 7.1-channel speaker packages). The receiver, which you can also buy separately as the HTR-5860, is a big step up from what you usually get with an HTIB. 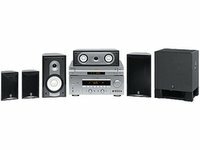 We can imagine that some buyers might continue to use the receiver and the DVD changer even after upgrading to a set of higher-quality speakers. The receiver and the DVD changer measure 17.1 inches wide and 16.5 inches deep, and both have a matching silver finish. They each come with their own remote, but we used the receiver's to control both units. For the DTX-5100, Yamaha nixed the ubiquitous silver-plastic satellites found on cheaper systems, such as Yamaha's own YHT-160, in favor of drop-dead-gorgeous speakers. The curvy satellites' beautiful faux wood grain and stunning high-gloss finish give them a decidedly high-end aura. The front-left and front-right monitors stand 13 inches high, the center is 14.5 inches wide, and the surround speakers are a lot smaller: 8.25 inches high. The small subwoofer (measuring approximately one cubic foot) forgoes the luxurious finish, but the textured black covering looks pretty sharp anyway--much better than the coverings on most HTIB subs. Straight out of the box, the Yamaha DTX-5100's sound seemed a little off-kilter; the center and surround channels were too quiet, and the overall sound very bass-shy. To remedy that, we hooked up the supplied microphone and ran through Yamaha's Parametric Room Acoustic Optimizer (YPAO) autosetup routine. We merely had to place the microphone in the listening position, bring up the setup menu, and press a few buttons. The DTX-5100 did the rest, emitting a series of tones and beeps from the speakers. Within a few minutes, the balances were accurately aligned and the sound much improved. We wish every brand's autosetup systems were this well thought out. The receiver delivers 95 watts to each of its 7 channels, but you get only five satellites and a subwoofer. Stranger still, since Yamaha doesn't sell the speakers separately, you can't add matching speakers to take advantage of the receiver's 7.1-channel capability; you can, however, substitute other manufacturers' speakers. That said, the receiver actually lets you connect as many as 11 speakers: the 7.1 configuration, a pair of B stereo speakers (for an adjoining room), and 2 "presence" speakers, which you place outside and above the normal left- and right-front speakers. We can't think of another HTIB with this level of versatility. Yamaha's proprietary sound-processing programs augment the standard suite of Dolby and DTS surround modes. Because the system uses a stock A/V receiver, its connectivity is about as good as it gets for HTIBs. The receiver has four A/V inputs, two of which accept component-video sources. Audio connections include two stereo inputs, five digital audio inputs (three optical, two coaxial), a set of 8-channel preamp outputs, a set of 8-channel SACD/DVD-Audio inputs, and one optical digital output. In addition to all those rear-panel options, it also has a front-panel A/V input that includes another optical digital connection. All the A/V inputs accept composite and S-Video connections, which the receiver will convert to component-video output--meaning you need to run only one set of video cables to your TV. There are no HDMI-connection options, though. The receiver is also XM ready, which means you need only add a Connect-and-Play antenna (such as the Audiovox CNP1000) and sign up for an account to direct-dial any of XM's dozens of music and talk channels. The five-disc changer plays Super Audio CDs (SACDs), DVD-Audio/DVD-Video discs, CDs, and just about any sort of home-burned CD-R or DVD-R, including MP3 discs. The specifications for the Yamaha DTX-5100 claim that the front-left and front-right speakers use a 6.5-inch woofer and an 0.75-inch tweeter, but we measured the woofer, and it's 5.5 inches in diameter. The center speaker has dual 3-inch woofers and an 0.5-inch tweeter, and the surround speakers use a single 3-inch woofer and an 0.5-inch tweeter. The speakers feature all-metal binding posts--a rarity on HTIB speakers--and the connectors accept banana jacks. The 130-watt subwoofer uses a down-firing 8-inch woofer. We started the Yamaha DTX-5100 on a music regimen, and the system's bright and clear sound immediately highlighted the detail on James Taylor's CDs. The DTX-5100 presented acoustic guitars with remarkable clarity, and Taylor's voice sounded realistic. As we listened to more CDs, though, we sensed a gap between the subwoofer's bass response and that of the satellites. Holly Cole's jazzy Temptation CD has a big-sounding stand-up bass, but on the DTX-5100, its definition wasn't up to snuff. Aerosmith's Rockin' the Joint CD didn't fully rock our world--the DTX-5100 didn't have enough power to convey the full sound of the band's music. We put most of the blame on the gutless subwoofer. The DTX-5100 didn't do justice to the sound of our SACDs and DVD-A discs, even when the subwoofer was pulling its weight. The sound of XM Radio passed muster, however. Turning to movies, the plane-crash sequence in The Flight of the Phoenix DVD was plenty scary, and the fierce commotion in the plane's cabin before its final impact was thrilling. We heard every metallic rattle, and the roar of the straining engines was exciting, but when the plane finally hit the desert sand, the subwoofer sounded overwrought and boomy, which we found a little distracting. Less demanding fare, such as The Lion King, sounded fine. Perhaps the subwoofer would suffice for very small rooms, but as we heard it, the Yamaha DTX-5100 is an HTIB in search of a decent sub. In the end, when looking for a stylish sound setup in the $1,000-to-$1,500 range, it's a toss-up between the DTX-5100, with its ample style and substantial speaker set, and knockout 2.1-channel systems such as the Denon S-301 and the Cambridge SoundWorks SurroundWorks 200.